In Parts 1 and 2 we looked at some of the features common to the “Système Lamy” in St. Germain-en-Laye and its EPO clone. In Part 3 we continue and conclude our study of the close political symbiosis between Battistelli and his fellow ENArque, Emmanuel Lamy. “They have also showed themselves to be well-versed in techniques for defaming or “smearing” their opponents.”Both Lamy and Battistelli have demonstrated considerable enthusiasm and ability when it comes to “shooting the messenger”. They have also showed themselves to be well-versed in techniques for defaming or “smearing” their opponents. Lamy’s ad hominem attacks on Emmanuel Fruchard from the Saint-Germain Autrement opposition group in connection with the SIDRU “toxic loans” affair are illustrative of his style in this regard. Lamy was evidently referring to Fruchard’s professional career as a quantitative mathematician and risk modelling expert which involved financial engineering and analyst positions with banks such as Credit Lyonnais and Lazard Frères & Cie in Paris as well as work in the area of financial software development as Director of Financial Engineering at Summit Systems in New York. The proposition that because Fruchard’s professional background enabled him to understand the technical details of the case he should have refrained from alerting the citizens of St. Germain to the risks of the “structured debt products” contracted by SIDRU is patently absurd. 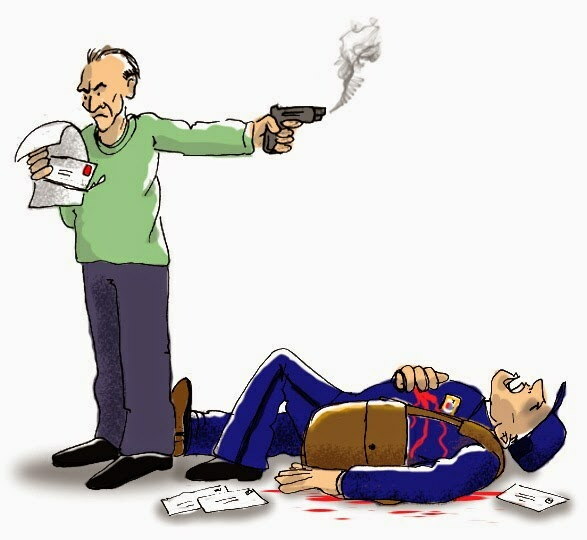 “Over at the EPO, Lamy’s acolyte “Sun-King” Battistelli has notched up an impressive hit-list of irksome “messengers” during the eight years of his unbridled “reign of terror”.”It just goes to show that Lamy was more interested in “shooting the messenger” than in responding to the problems to which Fruchard was trying to draw attention. 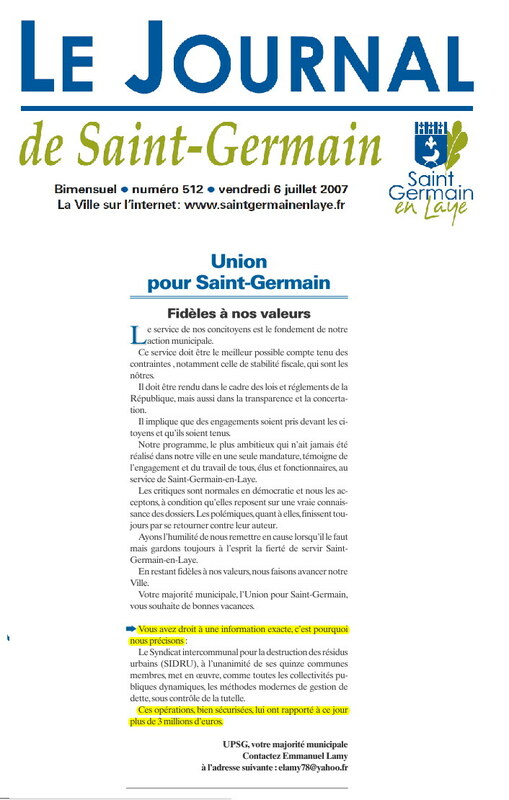 One of the most ridiculous accusations raised by Lamy against his political opponents came in September 2011 when he accused the members of the Saint-Germain Autrement group of “engaging in politics” – as if municipal councillors were prohibited from doing so! Over at the EPO, Lamy’s acolyte “Sun-King” Battistelli has notched up an impressive hit-list of irksome “messengers” during the eight years of his unbridled “reign of terror”. One of his first victims was Bernard Paye, the former head of Internal Audit at the EPO. According to reliable sources Paye was prominent in efforts among the EPO’s expatriate French community to canvass the French Administrative Council delegation against the endorsement of Battistelli’s candidature as EPO President in 2009. If these stories are true, then they probably help to explain why Paye ended up as a prime target on Battistelli’s hit-list. “Battistelli achieved international notoriety for the kind of vicious “smear tactics” he employed against his perceived opponents.”Paye’s openly stated opposition to Battistelli’s proposals for the abolition of the independent Audit Committee reporting to the Administrative Council led to his “elimination” as head of Internal Audit and to his subsequent forced assignment to a “fictitious” post as “Senior Advisor planning and preparation of the unitary patent” in October 2011. This vexatious transfer was later quashed by the ILOAT in its Judgment No. 3699 of 6 July 2016 and the Tribunal awarded Paye the sum of 12 000 Euros in moral damages and costs. See ILOAT 3699 [PDF]. 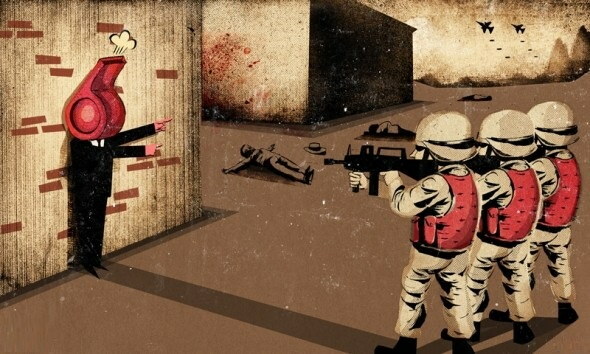 Other more prominent and well-documented cases of irksome “messengers” who ended up as victims of Battistelli’s firing squad include staff representatives and staff union officials in Munich and the Hague, as well as a member of the Boards of Appeal. Battistelli achieved international notoriety for the kind of vicious “smear tactics” he employed against his perceived opponents. It should be noted that Lamy — to his credit — never attempted to defame his political opponents as “Nazis”. Perhaps such cheap and patently transparent “smear tactics” would not have had much resonance in a local municipal political context in France. Or perhaps Lamy was simply smarter than Battistelli and realised the risks of such dubious tactics backfiring as they ultimately did for Battistelli in the more sophisticated cosmopolitan environment of the EPO. “The SIDRU “toxic loans” saga provides plenty of examples of Lamy’s modus operandi in this regard.”In any case the response of the EPO staff union to Battistelli’s “Defending our values” memo of October 2015 is still worth reading: “Not our values” [PDF]. Lamy and Battistelli have also shown themselves to be consummate masters of the fine art of disclaiming responsibility for one’s own mistakes and projecting the blame for any errors and failures onto others. The SIDRU “toxic loans” saga provides plenty of examples of Lamy’s modus operandi in this regard. From 2007 onwards Lamy appears to have been in a constant state of denial about the “toxic loan” problem and his own role in the affair. In the beginning he simply denied that there was any issue to be discussed and made extravagant claims that the “structured debt products” which had been contracted under his chairmanship had resulted in impressive tax savings for the citizens of St. Germain-en-Laye. Such claims were easy to make because the applicable accounting regulations for municipal and intercommunal associations like SIDRU assumed that such public bodies did not dabble in speculative financial products and consequently did not require the official accounts to include figures for the longer-term projected liabilities of such “structured debt contracts” (that is to say, the so-called “latent” or estimated losses over the lifetime of the loan). 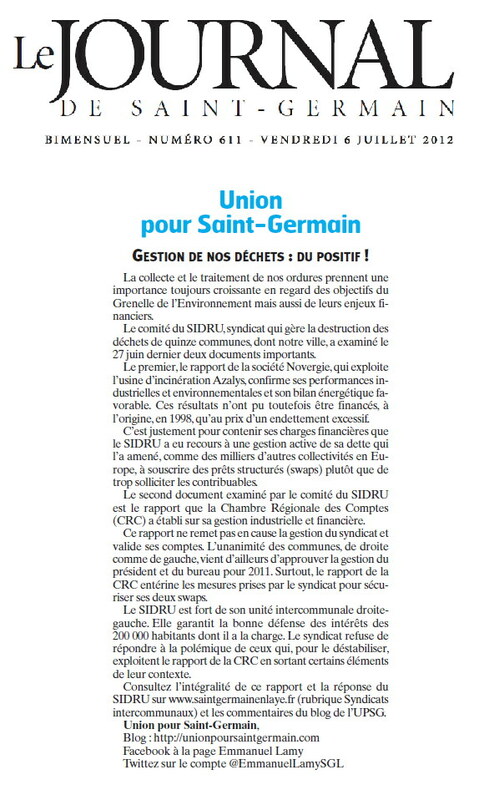 Towards the end of 2010, as reported in the current affairs magazine L’Express in September 2011 [PDF], the competent local public audit body (Chambre Régionale des Comptes d’Île de France) began an investigation into the management of SIDRU and it published its report in May 2012. Amongst other things the report [PDF] of the Chambre Régionale des Comptes (CRC) found that “SIDRU has taken risks that are incompatible with the principle of prudence that governs all public management” and spoke of “…an unpredictable speculation operation with unlimited risk”. Referring to the consequences of the dramatic rise in the applicable interest rates which occurred in 2011 the report noted that: “From 2011, [the toxic loans] will be transformed into net financial charges, to the point of jeopardising SIDRU’s financial equilibrium”. The Saint-Germain Autrement opposition group issued a press release summarising the findings of the CRC report and noting that it had confirmed their warnings about the “toxic loan” time-bomb ticking away at SIDRU. Lamy responded by publishing a statement on behalf of the UMP majority group in issue no. 611 of the Journal de Saint Germain under the title: “Gestion de nos déchets – du positif!” [Translation: “The management of our waste – positive news!”]. In this statement the CRC report was presented in terms which suggested that it had vindicated the management of SIDRU! Amongst other things, it was claimed that the report did not put the management of SIDRU into question and that it had “validated SIDRU’s accounts”. According to the statement the CRC report also “endorsed the measures which [SIDRU] had undertaken to secure the two swaps”. A further milestone in SIDRU’s “toxic loan” saga was reached with the first instance judgment relating to the DEPFA loan which was delivered by the Paris Tribunal de Grande Instance (TGI) on 29 January 2015 [PDF]. “Unfortunately Lamy’s optimism proved to be unfounded as the appeal proceedings before the Court of Appeal of Paris ended with a complete rout for SIDRU.”The TGI found that the DEPFA Bank had been at fault due to a failure to comply with its duty to warn SIDRU of the risks inherent in the loan contract. Nevertheless it rejected SIDRU’s request for an annulment of the contract and ordered it to pay outstanding loan amounts of the order of 10 million Euros. 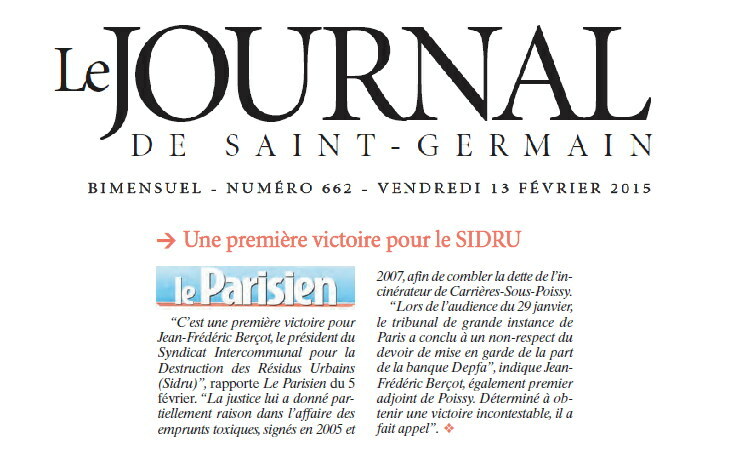 The opposition group Saint-Germain Autrement published a detailed analysis of the TGI judgement on its website and concluded that it was a significant defeat for SIDRU. Lamy’s response to the TGI judgment was to publish a “puff piece” in issue no. 611 of the JSG claiming “a first victory for SIDRU” along with a “spin-doctored” statement on behalf of the UMP majority group announcing that an appeal would be filed to ensure a final legally binding judgment in favour of SIDRU. Unfortunately Lamy’s optimism proved to be unfounded as the appeal proceedings before the Court of Appeal of Paris ended with a complete rout for SIDRU. “At the next meeting of the municipal council of St Germain on 16 November 2016 Lamy was obliged to defend himself in the face of questions tabled by opposition groups.”In its judgement of 4 November 2016 [PDF] the Court of Appeal revised the first-instance judgement to the further detriment of SIDRU and found it liable for all claims by DEPFA which in total amounted to just over 20 million Euros! “The SIDRU is an informed party to the contract, whose director, Emmanuel Lamy, Mayor of the commune of Saint-Germain-en-Laye, ENArque, head of mission for general economic and financial control for the Ministry of Finance, had all the skills required to understand and analyse the possible consequences of both a strong rise in the Euro against the Dollar and a strong rise in the Swiss Franc against the Euro even if such a scenario had been presented as unlikely”. In a statement published in the “Free Opinion” forum of issue no. 697 of the JSG the Saint-Germain Autrement group spoke in terms of a “damning judgment” against Lamy: “SIDRU: le jugement accable E. Lamy”. At the next meeting of the municipal council of St Germain on 16 November 2016 Lamy was obliged to defend himself in the face of questions tabled by opposition groups. According to a commentary written by Jean-Claude Merle, a former municipal councillor of the neighbouring municipality Marly-le-Roi, Lamy basically tried to dodge the question of his personal responsibility in the matter by referring to the collective responsibility of the 15 municipal councils that were the stakeholders of SIDRU as well as the roles of other authorities such as the regional prefect and the regional Chamber of Auditors. “The public record indicates that Lamy remained in a state of denial about his personal responsibility for the SIDRU toxic loan crisis right up to the very end.”In a further “spin-doctored” statement on behalf of the UMP majority group in issue no. 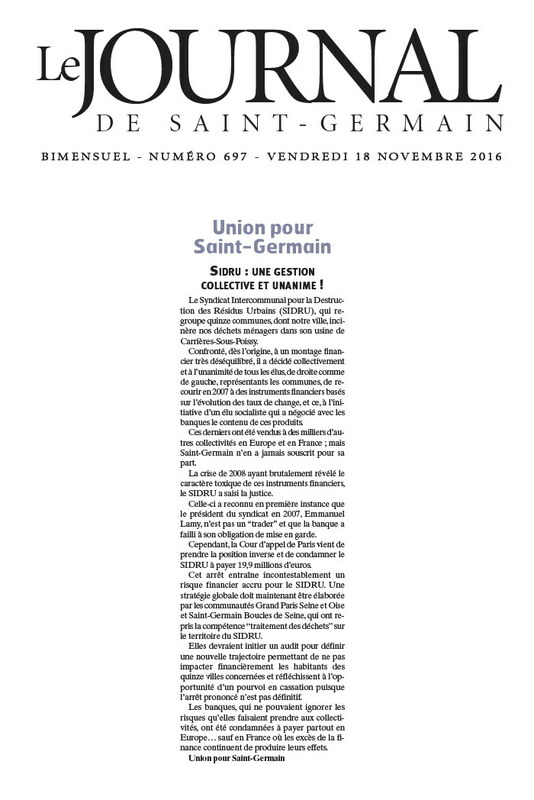 697 of the JSG published on 18 November 2016, Lamy again tried to suggest that everybody else apart from himself was to blame for the débâcle. He even suggested that the real problem was that in contrast to other European countries French courts were too lenient with regard the “excesses” of banks in such cases! The public record indicates that Lamy remained in a state of denial about his personal responsibility for the SIDRU toxic loan crisis right up to the very end. The EPO “Sun-King” Battistelli has shown a similar propensity to dodge responsibility for his own mistakes and to project the blame for problems and failures at the EPO onto any convenient scapegoats. “The EPO “Sun-King” Battistelli has shown a similar propensity to dodge responsibility for his own mistakes and to project the blame for problems and failures at the EPO onto any convenient scapegoats.”Battistelli’s preferred official narrative is that he is the “good guy” who has been the hapless victim of a relentless “defamation campaign” organised by the EPO staff union SUEPO as claimed for example in an interview published in World Intellectual Property Review in September 2014 [PDF] (“AIPPI 2014 Battistelli accuses EPO union of defamation”). EPO insiders can provide innumerable examples of Battistelli’s attempts to divert attention away from his own mistakes and to ridicule or belittle well-founded criticisms of his failures and excesses by independent observers. One prominent example should suffice to give a flavour of the “Sun-King’s” modus operandi in such matters. 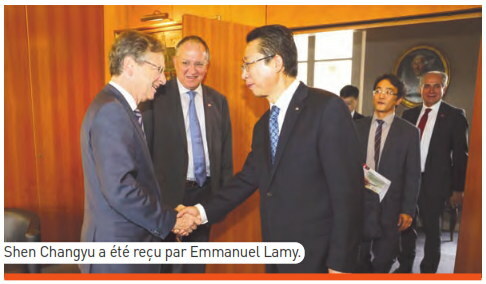 The close political symbiosis between Lamy and his fellow ENArque Battistelli was plain to see during the hosting of the annual EPO-SIPO Heads of Offices meeting which by a strange and unexplained stroke of good fortune took place in St. Germain-en-Laye on 5 October 2016 [PDF]. “The 2016 SIPO event appears to have been a “dress rehearsal” for the 2018 European Inventor of the Year Award which is soon to be held in St. Germain-en-Laye.”The event was celebrated in an extensive “puff piece” [PDF] which appeared in issue no. 695 of the JSG complete with colour photos of Battistelli and Lamy and Commissioner Shen of the Chinese State Intellectual Property Office. Battistelli’s legal “enforcer” at the EPO, Raimund Lutz, can also be seen lurking in the background in one of the photos. The 2016 SIPO event appears to have been a “dress rehearsal” for the 2018 European Inventor of the Year Award which is soon to be held in St. Germain-en-Laye. 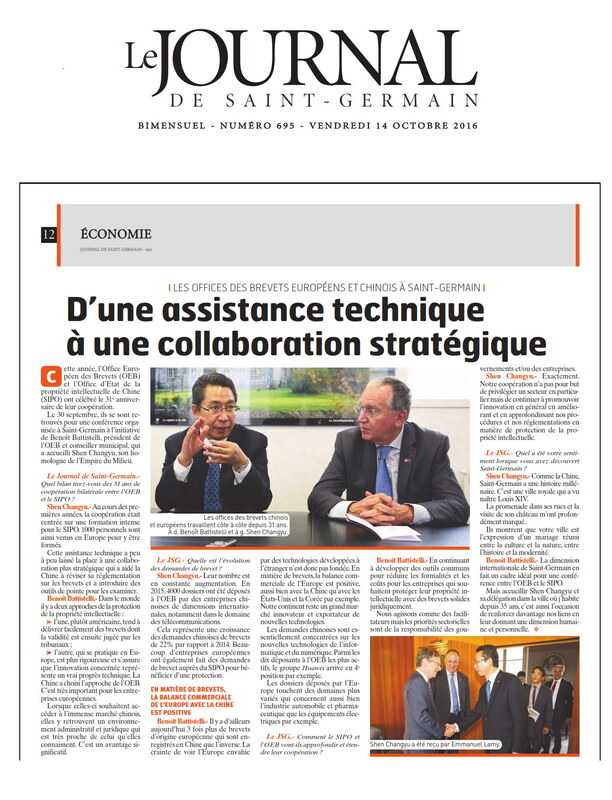 It would appear that Battistelli’s collaboration with the Mayor of St. Germain in such matters is continuing via Lamy’s successor, Arnaud Péricard. “In particular, the inimitable duo seem to be taking great care to ensure that there is not too much advance publicity about the extravaganza in the local media and in the municipal council perhaps in order to avoid unwanted public scrutiny and awkward questions as to how exactly St. Germain came to be chosen as the venue a mere three years after the event had been held in nearby Paris.”All the signs indicate that the new Mayor, Péricard, and his Deputy Mayor for culture, Battistelli, are colluding closely in the preparations for the Inventor of the Year Award which is scheduled to be hosted in the municipal theatre, Théâtre Alexandre Dumas, on 7 June 2018. In particular, the inimitable duo seem to be taking great care to ensure that there is not too much advance publicity about the extravaganza in the local media and in the municipal council perhaps in order to avoid unwanted public scrutiny and awkward questions as to how exactly St. Germain came to be chosen as the venue a mere three years after the event had been held in nearby Paris.